A typical Filipino dish that soothes the mouth and stomach of the Filipino people craving for soup blended with sour taste of tamarind juice and tomatoes. The perfect taste(that my family truly loved) blended with miso ingredient enriched the taste of yummy milk fish together with our very own pechay tagalog or mustasa. I remember during childhood w/ my siblings, our Sunday is "uniformedly" a "Miso Day"! Every after mass which end @ 9am, my father will cook this "ulam" preparation for our Sunday lunch. Of course the best part which is "ulo ng bangus" was reserved for Tatay, and the remaining parts..una unahan nalang! That is the scenario before. Two decades after, many changes happened, life changes.. but the "Sinigang na Bangus sa Miso" habit doesn't change. 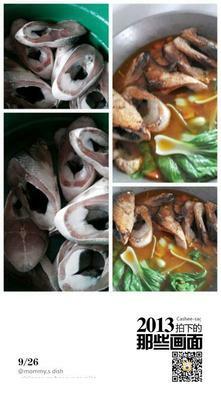 After my marriage, I remember, the first ulam I asked to my brother how to cook is "Sinigang na Bangus sa Miso"! Same ingredients, same procedure, same steps! Success! 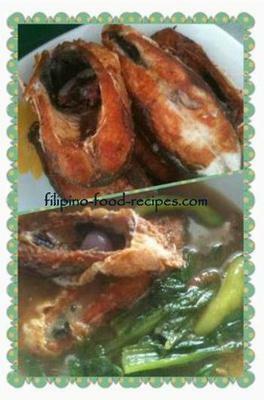 "a Man's heart is really through his stomach" and it's really proven with this "Sinigang na Bangus sa Miso" recipe! 1. In a frying pan, heat oil and fry the bangus until brown. 2. In the same frying pan, saute onion, garlic, ginger and tomatoes. 3.After a saute, add the miso and then add water and bring to a boil. 4.When it is already boiling, add pechay/mustasa together with sili, boil until vegetable is nearly cook. 6.Then put the fried bangus in the boiling water. 7. Serve with rice while hot. Join in and write your own page! It's easy to do. How? 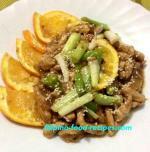 Simply click here to return to Do you have a Filipino food recipe to share?.